very nation has had its disastrous public officials at one time or another. Russia had Stalin, Germany had Hitler, England had Cromwell and the United States had J. Edgar Hoover. My first contact with J. Edgar began in the early 30s. Having made a balled-up mess out of Prohibition, which had now ended, J. Edgar was in very great need of publicity. The Justice Department ran on the theory that if they could get enough columns of print they could get enough Congressional appropriation to expand into a national police force. Accordingly they contacted writers’ organizations and offered to put all writers through their “G-man” school. Several writers, under one pen name or another, went down and popped .357 Magnum revolvers at bobbing picture targets and examined dead dummies that had just been “murdered” to solve the “crime.” But in general to be lectured at about how great J. Edgar was and how invincible were “G-men” and how vital it was for the Justice Department to run a national police force and hunt down people they designated as Public Enemies by number—No. 1, No. 2, etc. When queried as to who designated them and on what evidence, J. Edgar said his bosses did and as to evidence, that was a secondary matter. He said that these writers should write stories about “G-men” and the Justice Department would be glad to give them anything they wanted. Well, it worked. Even a magazine called “G-men” appeared. But I began to wonder about J. Edgar and his bosses at the Justice Department. 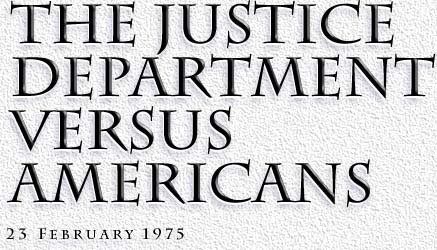 In World War II, the Justice Department took over counterintelligence for America and pretty well disbanded the Office of Naval Intelligence and other agencies.